Just two years later came the flowering of the first hybrid developed here at the Garden. 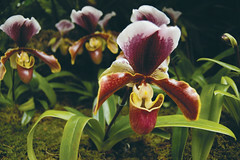 It was a Paphiopedilum hybrid, the first of many. In 1923, G.H. Pring of the Missouri Botanical Garden staff set off to Panama and Colombia on a trip to collect orchids and other economic plants. He returned with 5,000 cattleyas, clearly a successful trip. In 1926, the Garden established a tropical field station in Panama with the cooperation of the Canal Zone Government. Orchid collection began in earnest. By 1926, orchids at the Garden were being threatened by the industrial smoke and smog of the city, so the orchid collection was moved to the newly acquired Shaw Arboretum at Gray Summit, Mo., 30 miles outside of St. Louis. They were placed in a range of greenhouses built especially to house the collection. In 1927, an orchid seedling department was begun. Through gifts and collecting the orchid collection grew in size and prominence. In 1954, St. Louis was the site of the first World Orchid Congress. By 1958, conditions in the city had improved to the point that the orchid collection was returned to the Garden. Today, the Missouri Botanical Garden’s orchid collection still represents one of the largest and finest in the United States. The Garden has roughly 7000 orchid plants, representing approximately 280 genera. 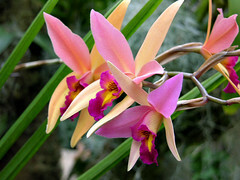 The collection includes over 2,500 unique orchid taxa. Emphasis has been placed on the most extensive genera Cattleya, Laelia, Encyclia, Oncidium and Paphiopedilum because they can survive the blistering St. Louis summers and offer a diversity of color and form that are valuable assets for displays and educational exhibits. 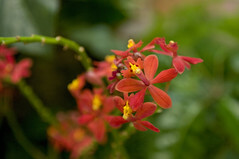 Orchids can be viewed in the atrium of the Beaumont Room in the Ridgway Visitor Center and in rotating Climatron® conservatory orchid displays. In addition, the Garden holds the annual Orchid Show from late January through mid-March in the Orthwein Floral Display Hall of the Ridgway Visitor Center.